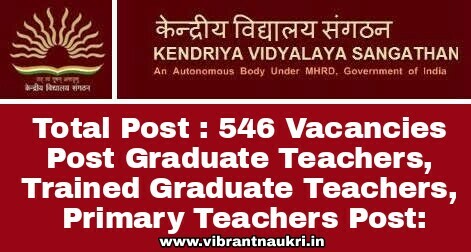 Kendriya Vidyalaya Recruitment 2017 | 546, Post Graduate Teachers, Trained Graduate Teachers, Primary Teachers Post: Kendriya Vidyalaya Sangathan has published recruitment notifications for below mentioned various Post Graduate Teachers, Trained Graduate Teachers, Primary Teachers post. More information please read below mention officially notifications carefully. Bachelor or Post Graduate Degree in relevant subject along with B.Ed. or equivalent from a recognized university. How to Apply : Apply online through the official website of Kendriya Vidyalaya Sangathan from 03-10-2017 onwards. The last date for online registration is 17-10-2017.